IQ Option offers a really wide range of tradable assets of which some can be traded with leverage (gearing) and some not. This not only depends on the type of instrument traded (for example stocks, forex, commodities, or cryptocurrencies), but also the nationality of the different market participants. For European clients, there is also a difference between professional traders and retail traders. IQ Option offers special cryptocurrency CFDs to non-EU and pro EU traders. An example is Bitcoin x100 which is traded with a fixed leverage setting of 1:100. Not only do these special crypto CFDs have higher leverage compared to the standard crypto CFDs, but they also have tighter spreads, fixed leverage, and expire on a daily basis. As you can see in this table, retail traders residing in the European Union (except pro EU traders) are limited in the amount of leverage they can use with their trading, when compared to non-EU traders. Let’s go into more detail about the amount of leverage available for different asset classes inside and outside of the European Union. IQ Option offers special cryptocurrency CFDs to non-EU and pro EU traders. An example is Bitcoin x100 which is traded with a fixed leverage setting of 1:100. Not only do these special crypto CFDs have higher leverage compared to the standard crypto CFDs, but they also have tighter spreads, fixed leverage, and expire on a daily basis. Other special cryptocurrency instruments include TRON x50, Cardano x20, Iota x20, Stellar x20, Ethereum x50, Ripple x20, and NEM x20. As you can see in the table above, retail traders residing in the European Union are limited in the amount of leverage they can use with their trading, when compared to non-EU traders and pro EU traders. Let’s go into more detail about the amount of leverage available for different asset classes inside and outside of the European Union. Cryptocurrencies are generally much more volatile than the global stock markets and especially the forex market. It is also much less liquid than, for example, the major currency pairs. With this in mind, it comes as no surprise that IQ Option limits the available leverage on standard cryptocurrency CFDs to 1:1 (no leverage) for EU retail traders and 1:10 for non-EU citizens and EU pro traders. *Please note that these leverage settings may change from time to time. IQ Option’s investment multiplier is another term for leverage. As you can see above, the standard bitcoin CFD can be traded with 1:10 leverage (by non-EU and professional EU clients). The forex market is known for its exceptional trading volume and liquidity. Also, the forex market is usually less volatile than both the cryptocurrency and stock markets. From a broker’s point of view, this makes forex a safer asset class to offer high leverage on. IQ Option offers up to 1:30 leverage (x30 investment multiplication) on forex instruments for their retail clients in the European Union and up to 1:1000 (x1000 investment multiplication) for non-EU and professional EU clients. Few forex brokers have incorporated such an easy-to-use leverage-alternating feature into their trading platforms. This incredible tool enables traders to apply different leverage settings to different trades in the same trading account. 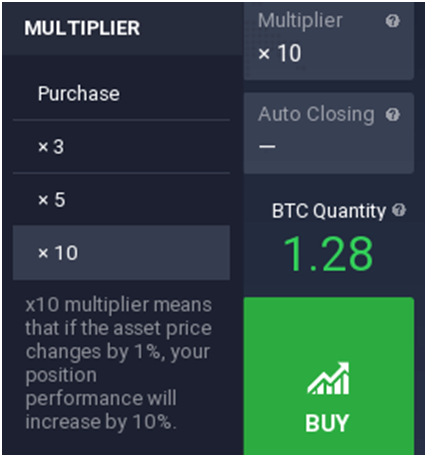 IQ Option users can easily make adjustments to the leverage they use by opening the ‘Multiplier’ tab on their platforms and selecting the appropriate multiplier coefficient. IQ OPTION OFFERS A WIDE RANGE OF INVESTMENT MULTIPLIER OPTIONS ON FOREX PAIRS. THIS EXAMPLE IS ON THE EUR/USD. Please note that 1:1000 leverage (for non-EU based traders and professional EU traders) is not available on all currency pairs offered by IQ Option. A good example is the USD/TRY (U.S. dollar/Turkish lira) which is classified as an exotic currency pair. On this pair, the maximum leverage is 1:100. It is common for brokers to offer lower leverage on currency pairs with lower trading volume and liquidity. It may also be the case with currency pairs that pose a great risk of unexpected volatility. Global stock markets offer great investment and trading opportunities. One of the features which makes IQ Option incredible, is the variety of financial asset classes and instruments which can be traded on one single platform. That’s right, on one single platform. Forex traders who also like to trade stock CFDs can simply open a stock chart in their same IQ Option platform and trade it right off the chart… with leverage of up to 1:20! *For retail EU traders the maximum leverage on individual stocks is 1:5. A typical example would be the Apple company’s shares that can be traded with leverage (multiplier) settings of x3, x5,x10, and 20x by non-EU and professional EU traders. Retail traders residing in the European Union are no longer able to trade individual stocks with the same maximum amount of leverage (1:10) as that which non-EU residents had before. Pro EU traders, however, can use 1:20 leverage, just like non-EU traders. IQ Option has quite a couple of commodities you can trade. These include gold, silver, platinum, crude oil, corn, and a few others. Retail traders from the EU can trade these commodities with leverage of up to 1:20 while non-EU traders and pro European traders are more flexible with leverage of up to 1:150. With IQ Option, clients can also trade ETFs! Non-EU and pro European traders can use leverage of 1:100 while retail traders from the European Union can trade with leverage of up to 1:5. IQ Option’s stock indices can be traded by non-EU and pro EU traders with a single leverage setting of 1:150. Considering that these indices can be very volatile at times, this is a decent amount of leverage which can be used to magnify gains (and of course, losses). Retail European traders are restricted by ESMA (the European Securities and Markets Authority) to a maximum leverage setting of 1:5 on stock indices. IQ Option has more than 10 stock indices to choose from. These are major indices from the United States, the United Kingdom, France, Germany, Australia, Spain, Japan, different European countries (EU 50 index), and Hong Kong. A trader with a $1000 trading account decides to engage $10 of his account in a buy (long) trade on the EUR/USD. He selects an investment multiplier of x500 and clicks ‘buy’. Immediately after opening this position, his available account balance is reduced to $990. Because he uses 1:500 leverage, the notional value of his position is not $10, but $5000 (500 times $10). During the course of a few days, the EUR/USD rises by two percent and the trader checks to see how much his floating profit is on this trade. Because the notional value of the trade is $5000, the two percent rise in the EUR/USD results in a profit of two percent of $5000, which is $100. Did you notice that this trader was able to open a trading position with a notional value which is larger than his entire trading account and still have more than enough funds left to initiate other trades? This can make leverage a powerful tool because traders can get much more out of their trading accounts, so to speak. If the trader had invested the same $10 and selected the x25 multiplier option (which is the lowest leverage option) before opening the trade, the two percent rise in this currency pair would have resulted in a much smaller profit of two percent on $250, which is $5. * To simplify these examples, these calculations do not include transaction costs. 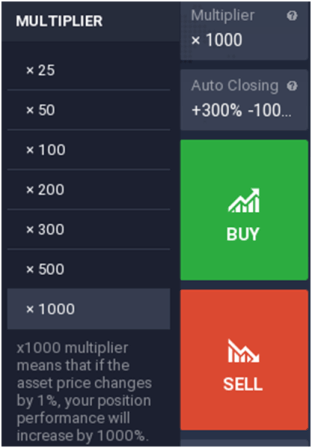 Using IQ Option’s multiplier, or leverage, should be done carefully because not only are profits magnified by leverage, but also losses. When trading with leverage, market participants who use margin accounts (like those trading with IQ Option) borrow money from their broker in order to trade larger positions than which would be possible under normal, unleveraged conditions. The relatively small amount of money engaged in a trade (e.g. the $10 invested in the 1:500 leveraged EUR/USD trade) is kind of like a deposit reserved in the trader’s account to support that leveraged trade. It is the small part of the large position which the trader needs to come up with. Almost like a deposit paid on a house which is financed by a bank. May your investment be multiplied… happy trading!